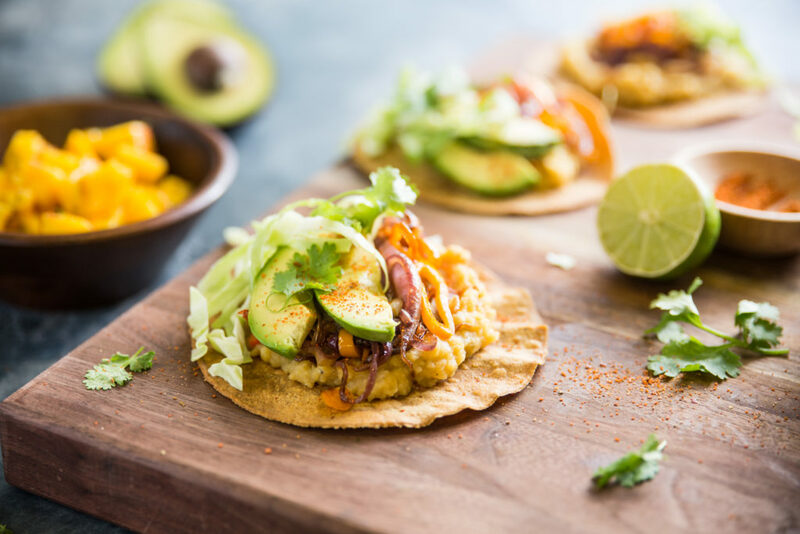 Lime-kissed red lentils, sauteed veggies, creamy avocado and fresh cilantro, piled high over a crispy tortilla. It doesn’t get any better than this! 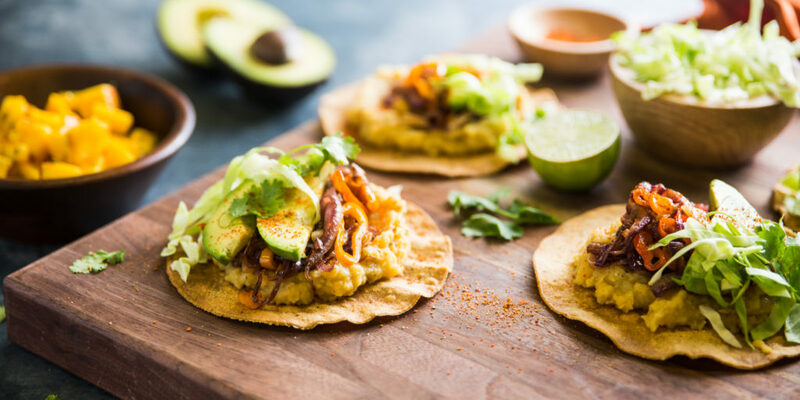 We are excited to bring you this latest Wicked Healthy recipe that we’ve created with our friends over at Purple Carrot! 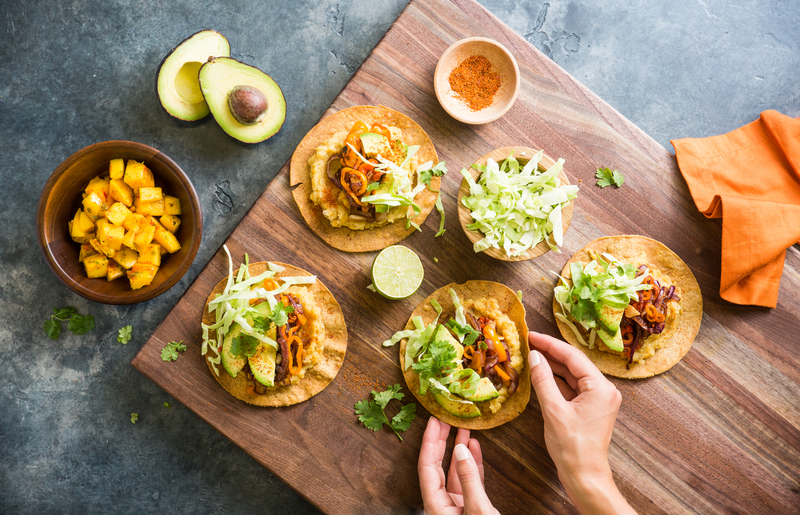 Although summer is winding down, we’re still hanging on with these amazingly fresh and crispy tostadas, with a sweet mango salad on the side, dusted with Mexican chili spice. Be sure to do all of your prep before you start cooking, which makes this dish a breeze to assemble! The secret to getting a crispy tortilla is applying an even and light coat of oil with a pastry brush. If you don’t have one, use your hands! Placing the tortillas between baking sheets to bake will keep them flat, but feel free to bake them uncovered for a more rustic look and feel. This is a wicked easy way to combine fresh, cooked, sweet, spicy, crispy and soft elements all together in one spot! 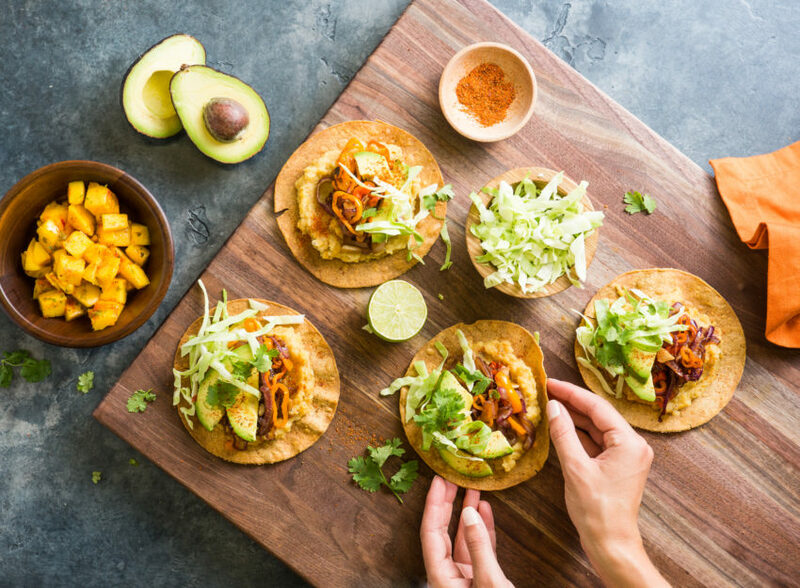 If you’d like to make this dish, we’ve included a variation of it below, but you can also sign up at Purple Carrot to receive all of the pre-measured ingredients to make this Wicked Healthy meal! First-time customers can get $30 off via this link or by entering the promo code “wickedhealthy” at sign-up. In case you missed it, check out our recent interview with Andy Levitt, CEO and Founder of Purple Carrot, and check out our other Purple Carrot recipes here! To cook the lentils, add the red lentils,1¼ cups water, and a pinch of salt to a small saucepan. Bring to a boil, cover, and reduce heat to low. Cook until the lentils are tender and all of the water has been absorbed, about 14 to 17 minutes. To crisp the tortillas, preheat oven to 400°F, and lay them on a large baking sheet. It’s okay if they overlap slightly. 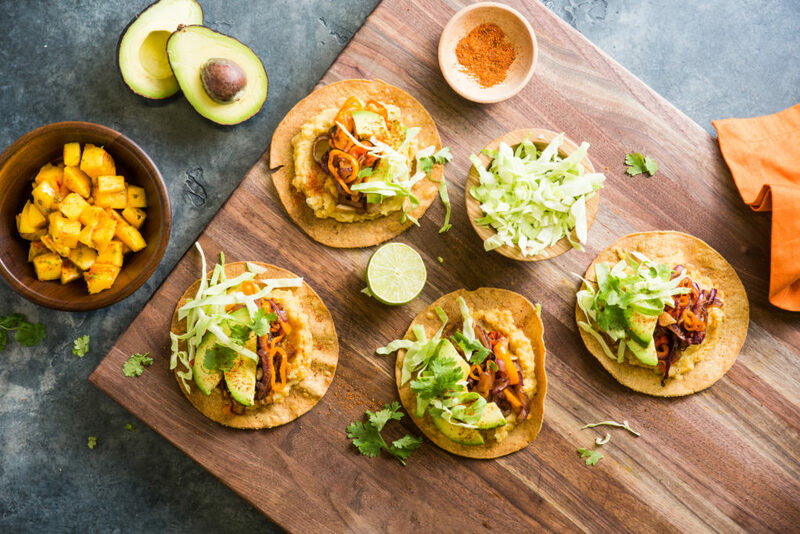 Brush both sides of each tortilla with ½ tsp vegetable oil and place another baking sheet on top to hold them down. Bake tortillas until golden brown and crisp, about 10 to 12 minutes. To prepare the veggies, place a large skillet over medium-high heat and add 1 tbsp vegetable oil. Once hot, add the garlic, peppers and onion, and a pinch of salt and pepper. Adjust heat to low, and cook until vegetables are soft and caramelized, stirring occasionally, about 12 to 15 minutes. To make the mango salad, zest the lime. Peel the mango, remove the flesh from the pit and dice. In a large bowl combine the diced mango, all of the lime zest, and the juice from half. Sprinkle mango salad with the Tampico and toss to combine. Once the lentils are ready, mash them with a fork (they should be spreadable). Squeeze in the juice from the remaining lime half, taste and season with salt and pepper. 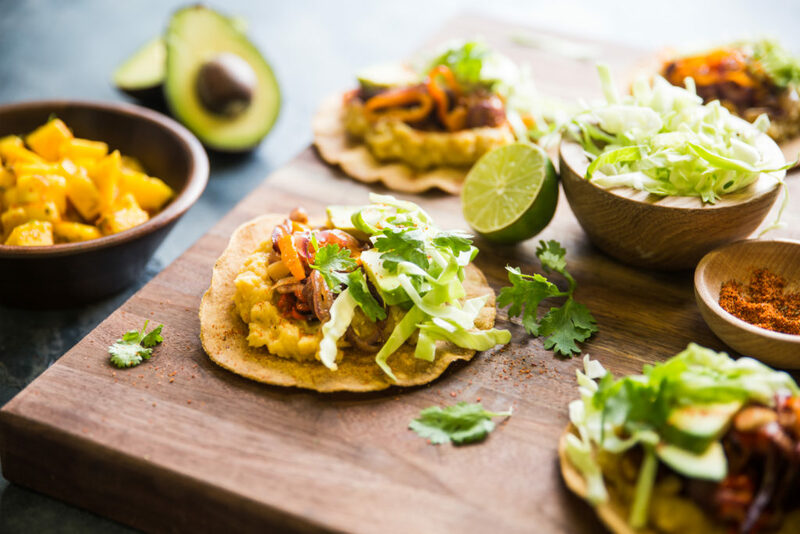 To serve, place the tortillas on large plates and top with the smashed red lentils. Layer on the fajita veggies, green cabbage, and avocado. Sprinkle with the cilantro, remaining Tampico and serve with the chili-lime mango salad. Dig in!